Scientists from the US Naval Research Laboratory are working on a firefighting robot which they hope will tackle blazes on-board military ships. Created in partnership with the US Office for Naval Research, Octavia is designed to interact with people through a combination of speech and visual recognition. 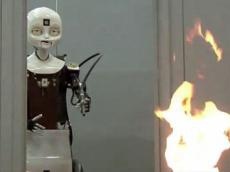 Once directed to a fire by a human, the strange-looking robot uses two infrared cameras to 'see' the blaze, then shoots compressed air and water, stored on its back, at the flames through a hose. The scientists are developing the technology in the hope that it will help humans to help tackle fires, which are particularly dangerous on-board ships. Although the footage suggests the design is currently lacking the responsiveness necessary to help in a genuine emergency, the robot is said to be a work in progress. According to the scientists behind Octavia, particular attention is being paid to improving the naturalness of interactions with humans and robot's ability to recognise the way fire spreads so it is better able to extinguish blazes.